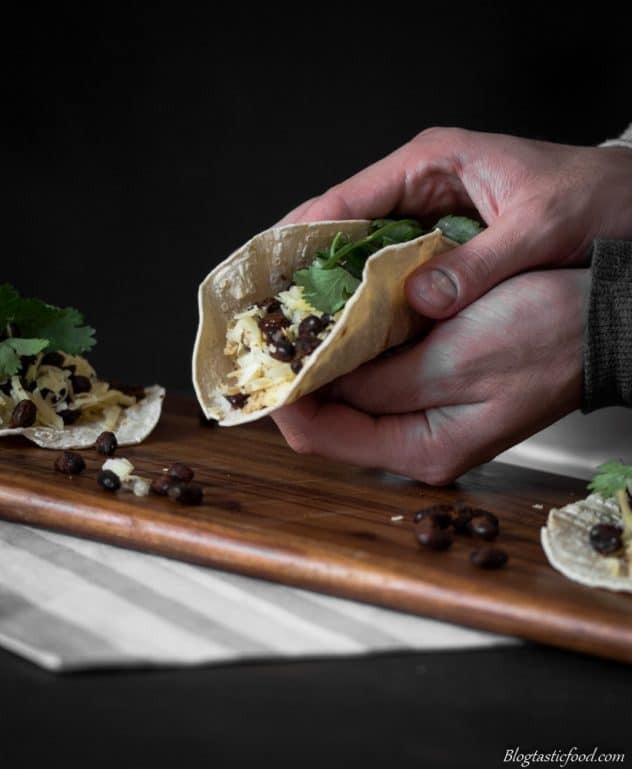 Smooth, soft, silky scrambled eggs with the most amazing, crispy spiced black beans, grated cheese and a little hot sauce to finish it off. 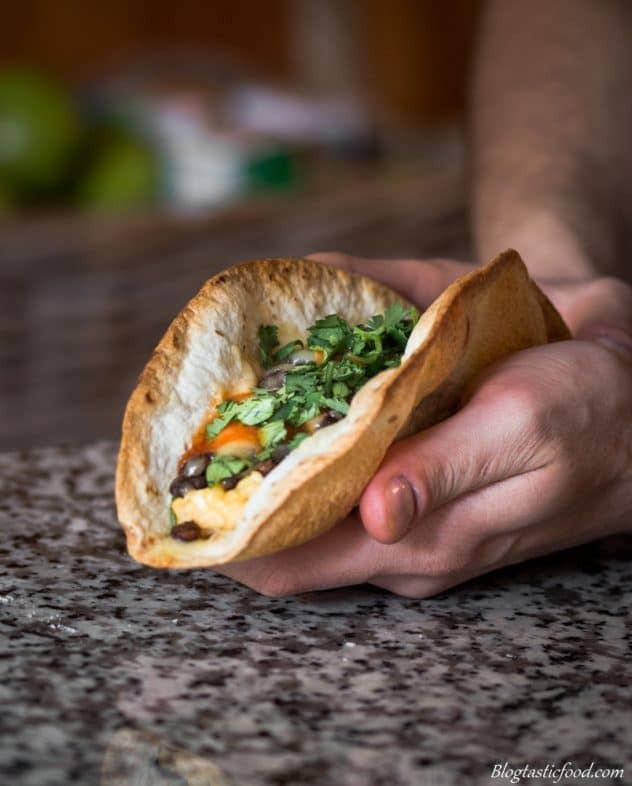 What more could you want in a breakfast taco? So you want a breakfast that’s a little more interesting huh? Cool, me too! So let’s taco bout it. 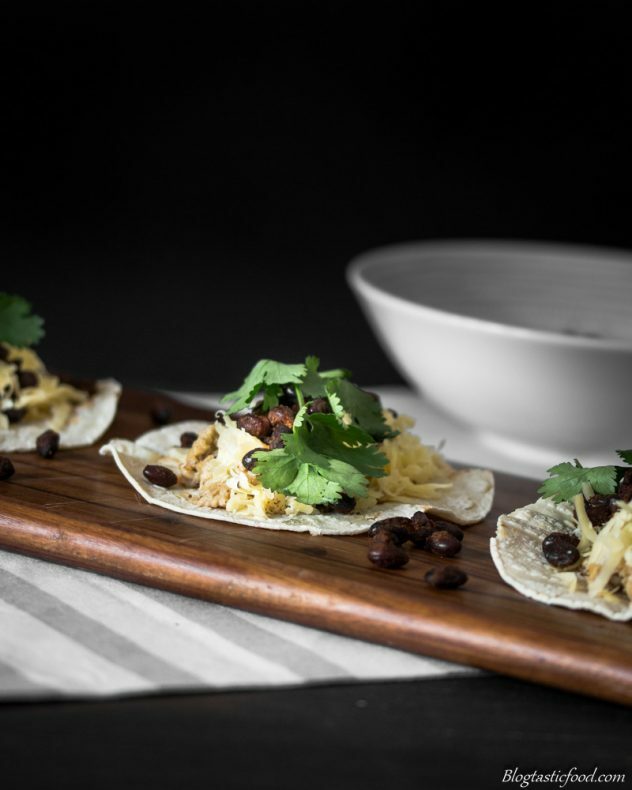 As you can see in the recipe, I use habanero sauce to spice these tacos up. To my surprise, it wasn’t as spicy as I thought it would be. Honestly, I wish it was a little hotter but I think it was just the brand of hot sauce I used. I imagine that habanero sauce would usually be super hot since the habanero chilli sets your mouth of fire. However, if you’re not a fan of really intense heat, please feel free to go as mild or as chilli as you like when selecting your hot sauce. You could also get a hot sauce that has a little sweetness, or one that has a tangy vibe, it’s up to you! Perhaps you may not want any heat in your taco, totally fine. Add a squeeze of lemon, bbq sauce, even something like chimichurri would be awesome. But I want a hard shell taco! Ok, so before you go off buying taco shells at the supermarket, I encourage you to try this instead. 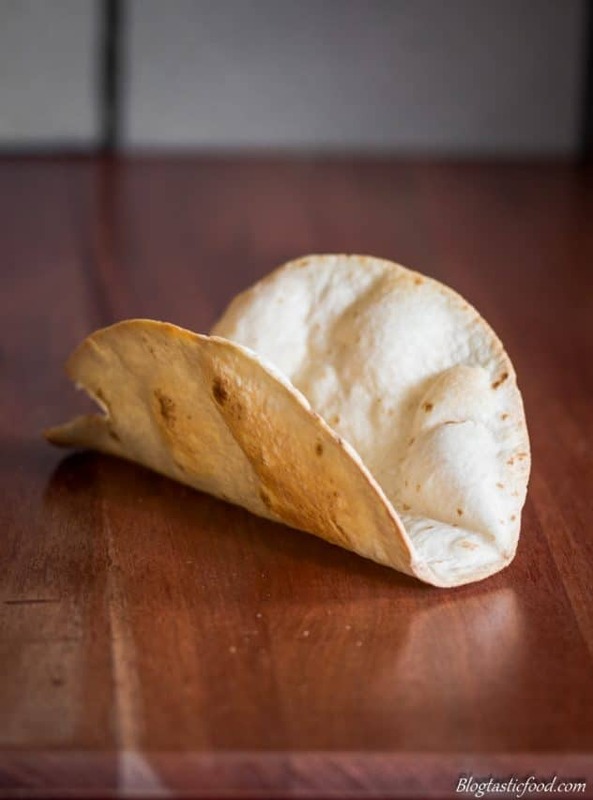 Here is what I did to make my own gorgeous homemade hard taco shell. I see a lot of people deep fry their tortillas to make the hard shell. Now I don’t know about you, but for me, that may be a little too heavy for breakfast. So this is what I did. 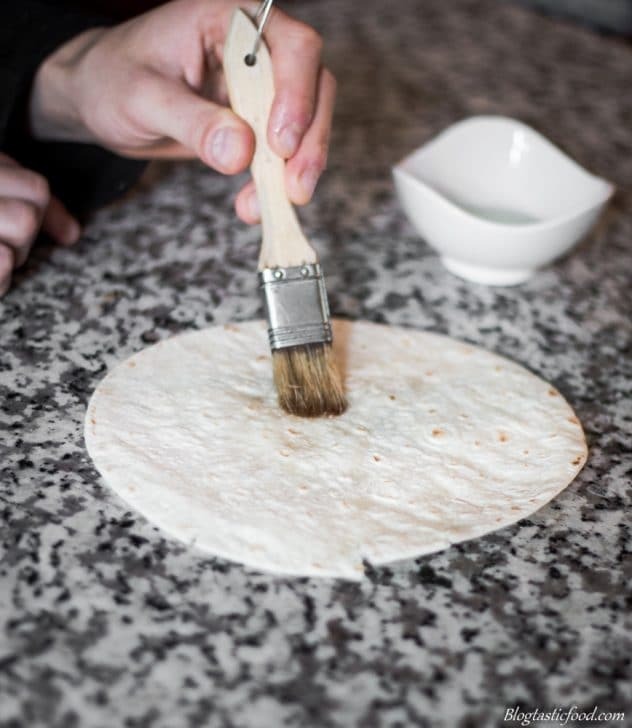 Now, you don’t need to put any oil on the tortilla, but I just like to brush a very lite coating on top as it helps to make the tortilla go extra crispy. So I fried some garlic in vegetable oil, then I used a pastry brush to brush some of that garlic infused oil over the tortillas. 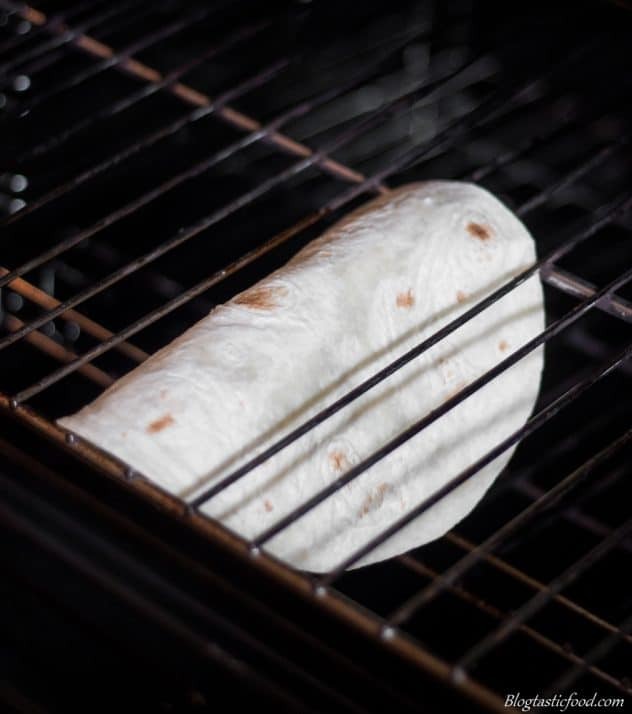 From there, I just draped the tortillas over the bars of the oven rack, then I just toasted the tortilla in an oven pre-heated at 200 degrees Celsius (400 degrees F) for 5 minutes. And it’s that simple! 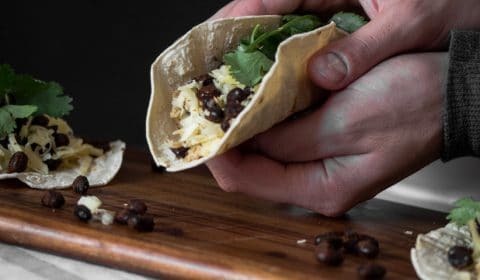 Now, if you want to take these tacos level up, you can fill them with the egg and the beans, you can then top that with some of your grated cheese, put those tacos on a baking tray and then just wack it back in the oven and wait for the cheese to melt. So that is what you do if you want a hard shell taco. And there is no way anyone could complain about that for breakfast right?! Once you cook the beans, you realise how addictive they are!! I honestly couldn’t stop snacking on them as I was peppering these tacos. They have so much flavour and they work so well with the soft scrambled eggs. I also love using these beans to makes quesadillas. And now that I have mentioned it, I go through how to make the most amazing Chicken Teriyaki Quesadillas so if that interests you, go check it out. Ok, moving on. This method of cooking the beans also works really well with chickpeas, also known as garbanzo beans. So if you want you can use them instead, or you could have a mixture of both!! 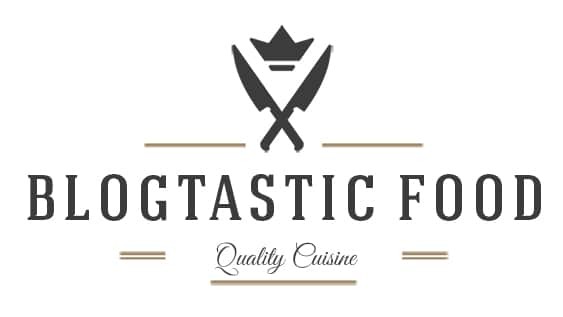 Thank you for checking out my blog, I really appreciate you taking the time. If you want to subscribe to stay updated for more awesome recipes like this, please do so. You can also follow my social media platforms, I’m on Facebook, Twitter, Pinterest and Instagram. The perfect breakfast/brunch that will fill you up with no trouble. Mix the beans, paprika, cumin and salt in a bowl. Pre-heat a pan on medium-high heat, half of your oil, then add your beans. Cook in the pan for about 5 minutes tossing/stirring occasionally until slightly coloured. 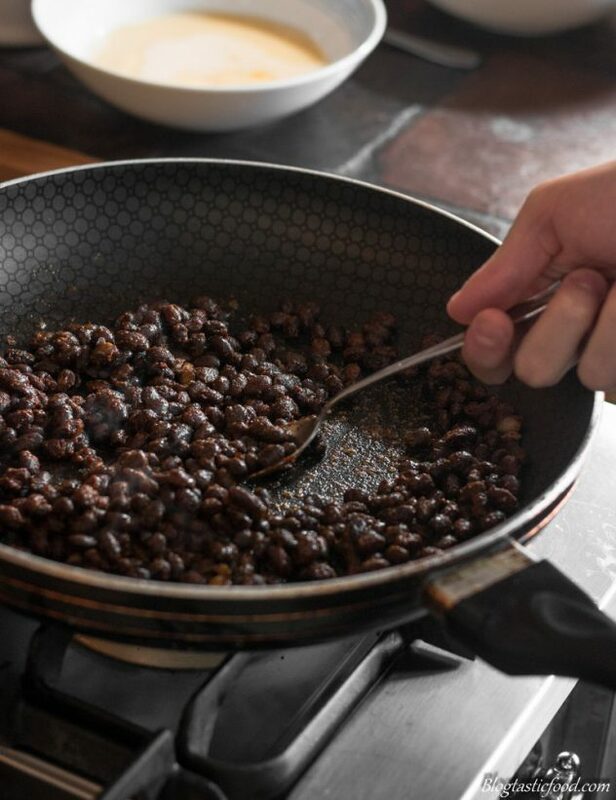 Take the pan off the heat, then transfer the beans onto kitchen paper. Wash the pan for the next step. Whisk the eggs, milk and a pinch of salt and pepper together in a bowl. Place in the pan with your the other half of your olive oil back over low heat. Add your egg mixture, stir the scrambled eggs and then take the pan off the heat whenever the eggs start sticking to the bottom of the pan. This ensures heat control so the eggs don't overcook. Keep this cycle going until the eggs are cooked to your liking. Then turn the heat off and set aside. Toast the tortillas in a griddle pan until you get a bit of colour on them. 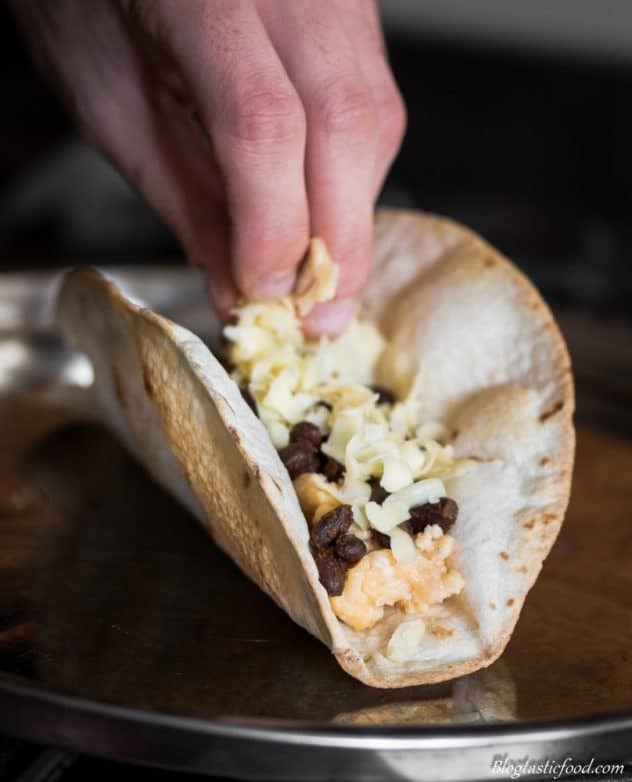 Put the scrambled eggs, cheese, beans, coriander and a touch of habanero sauce in the middle of the tortillas. Lift up the sides of the tortilla taco style and then eat it! You have to use habanero sauce. You can go for any other type of hot sauce and you can get one with a little bit of chilli, or a lot. 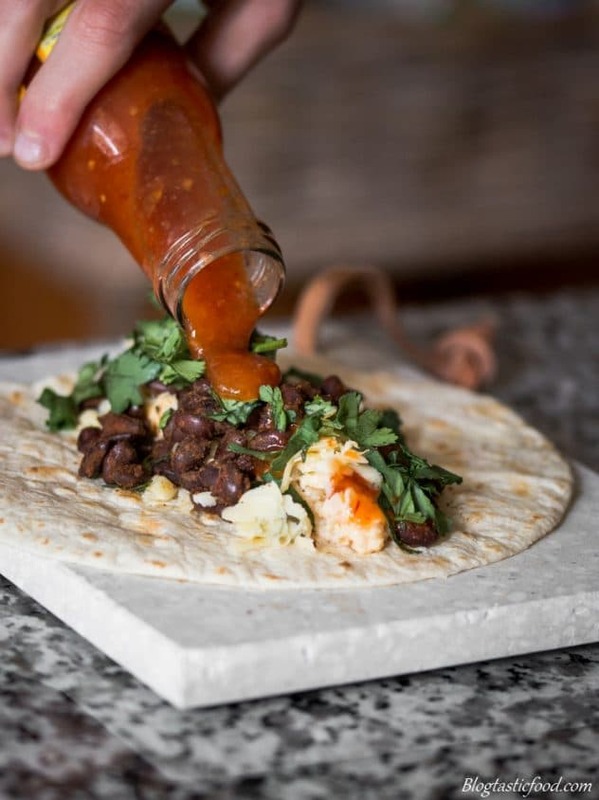 You can use any hot sauce you want. It doesn't have to be habanero sauce. You can drape the tortillas over an oven rack, place in the oven and toast the tortillas to make hard shell tacos. Chickpeas are a great alternative to black beans.